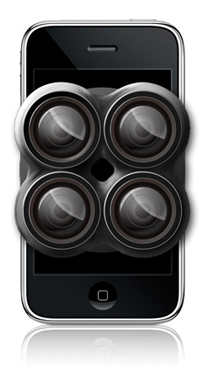 July 28th: QuadCamera v1.95 compatible iPhone OS v3.0 was released today. Hurray! iPhone OS v3.0 has been release for a month now, and most of the apps I use have been updated to run on this latest release. Except for one: Quadcam by Takayuki Fukatsu. Quadcam is a mutishot camera app that takes 4 or 8 timelapses images and sets them up in one or tow rows with soft focus and slightly overexposed edges. Not unlike a Lomography cameras do. Takayuki Fukatsu submitted v1.95 (iPhone 3.0 compatible) for review well before the release date, but still hasn't received any news from Apple. Positive or negative. People purchasing the current app (v1.9) without reading the notice, end up disappointed with a blank screen. Takayuki mentions on his blog that there are over 70'000 Quadcam users out there and that he couldn't talk about the problem before the 3.0 release because he was under NDA, and that if he pulls the app out of the store, updates can't be provided anymore. Follow him on Twitter for more updates. This brings us back to Apple's iPhone opaque app review process that has been widely discussed elsewhere. According to Takayuki, other camera related applications are suffering from the same issue, like Darkroom (iTS link). The word is out that this has to do with the multishot capabilities of Quadcam competing with Apple's video app. This would be ridiculous. I hope this is just a case of app review overload, and that the latest version of Quadcam (v1.95) will hit the Update pane of my iPhone any day now. You will find example of pictures taken with Takayuki Fukatsu's Toy Camera apps on Flickr. A few examples can also be found in my Flickr feed of Quadcam tagged photos . Apparently, EasyCam and CameraZoom updates have appeared on the Store. Let's hope Quadcam will be soon to follow. Is Quadcam available anywhere? I loved it. Thanks!